A "wandering" black hole has been found in the outer regions of a galaxy about 4.5 billion light years from Earth. Evidence suggests this newly discovered black hole has about 100,000 times the Sun's mass, and was originally located in a smaller galaxy that merged with a larger one. Chandra data show this object gave off a tremendous amount of X-rays, which classifies it as a "hyperluminous X-ray source". The burst of X-rays may have come from a star that was torn apart by the strong gravity of the black hole. Astronomers have used NASA's Chandra X-ray Observatory and ESA's XMM-Newton X-ray observatory to discover an extremely luminous, variable X-ray source located outside the center of its parent galaxy. This peculiar object could be a wandering black hole that came from a small galaxy falling into a larger one. Astronomers think that supermassive black holes, with some 100,000 to 10 billion times the Sun's mass, are in the centers of most galaxies. There is also evidence for the existence of so-called intermediate mass black holes, which have lower masses ranging between about 100 and 100,000 times that of the Sun. Both of these types of objects may be found away from the center of a galaxy following a collision and merger with another galaxy containing a massive black hole. As the stars, gas and dust from the second galaxy move through the first one, its black hole would move with it. A new study reports the discovery of one of these "wandering" black holes toward the edge of the lenticular galaxy SDSS J141711.07+522540.8 (or, GJ1417+52 for short), which is located about 4.5 billion light years from Earth. This object, referred to as XJ1417+52, was discovered during long observations of a special region, the so-called Extended Groth Strip, with XMM-Newton and Chandra data obtained between 2000 and 2002. Its extreme brightness makes it likely that it is a black hole with a mass estimated to be about 100,000 times that of the Sun, assuming that the radiation force on surrounding matter equals the gravitational force. The main panel of this graphic has a wide-field, optical light image from the Hubble Space Telescope. The black hole and its host galaxy are located within the box in the upper left. The inset on the left contains Hubble's close-up view of GJ1417+52. Within this inset the circle shows a point-like source on the northern outskirts of the galaxy that may be associated with XJ1417+52. The inset on the right is Chandra's X-ray image of XJ1417+52 in purple, covering the same region as the Hubble close-up. 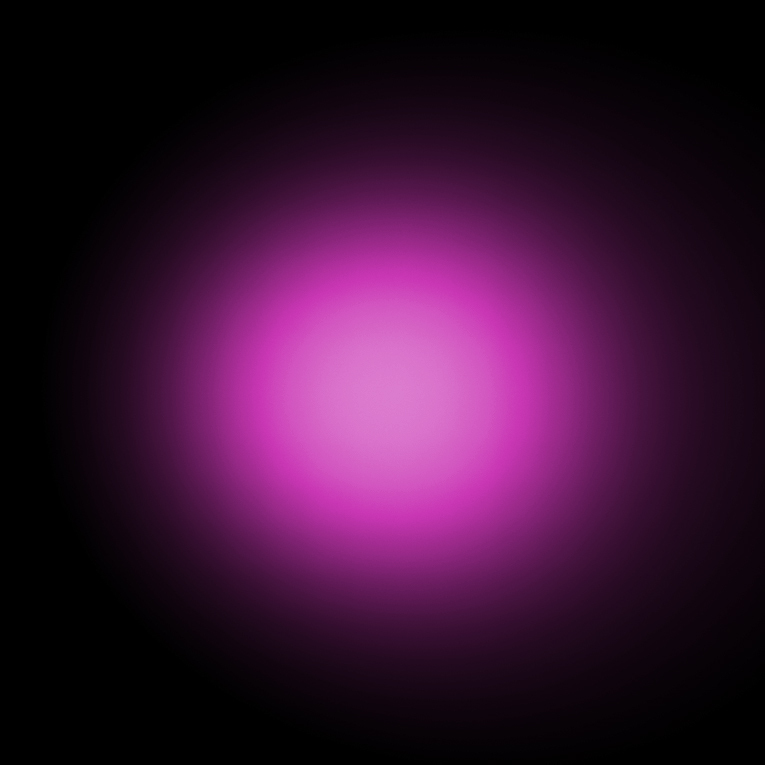 This is a point source, with no evidence seen for extended X-ray emission. The Chandra and XMM-Newton observations show the X-ray output of XJ1417+52 is so high that astronomers classify this object as a "hyper-luminous X-ray source" (HLX). These are objects that are 10,000 to 100,000 times more luminous in X-rays than stellar black holes, and 10 to 100 times more powerful than ultraluminous X-ray sources, or ULXs. At its peak XJ1417+52 is about ten times more luminous than the brightest X-ray source ever seen for a wandering black hole. It is also about 10 times more distant than the previous record holder for a wandering black hole. 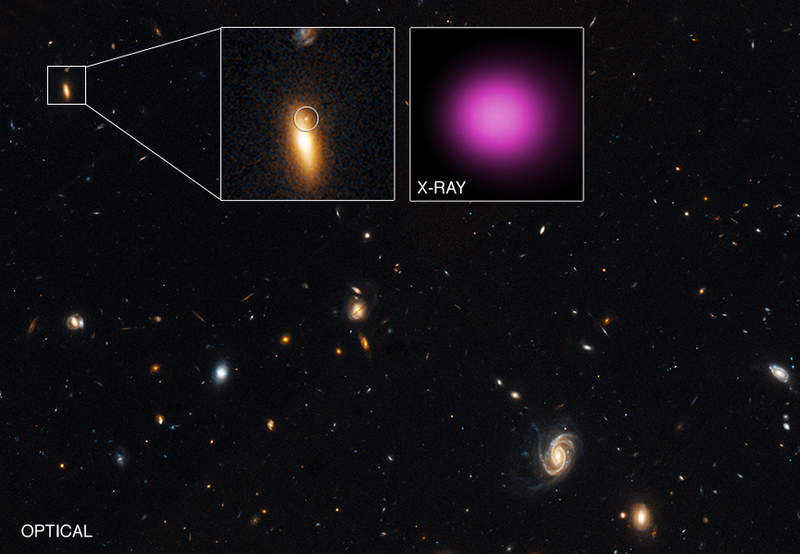 The bright X-ray emission from this type of black hole comes from material falling toward it. The X-rays from XJ1417+52 reached peak brightness in X-rays between 2000 and 2002. The source was not detected in later Chandra and XMM observations obtained in 2005, 2014 and 2015. Overall, the X-ray brightness of the source has declined by at least a factor of 14 between 2000 and 2015. The authors theorize that the X-ray outburst seen in 2000 and 2002 occurred when a star passed too close to the black hole and was torn apart by tidal forces. Some of the gaseous debris would have been heated and become bright in X-rays as it fell towards the black hole, causing the spike in emission. The location and brightness of the optical source in the Hubble image that may be associated with XJ1417+52 suggest that the black hole could have originally belonged to a small galaxy that plowed into the larger GJ1417+52 galaxy, stripping away most of the galaxy's stars but leaving behind the black hole and its surrounding stars at the center of the small galaxy. If this idea is correct the surrounding stars are what is seen in the Hubble image. A paper by Dacheng Lin (University of New Hampshire) and colleagues describing this result appears in The Astrophysical Journal and is available online. NASA's Marshall Space Flight Center in Huntsville, Alabama, manages the Chandra program for NASA's Science Mission Directorate in Washington. The Smithsonian Astrophysical Observatory in Cambridge, Massachusetts, controls Chandra's science and flight operations. Coordinates (J2000) RA 14h 17m 11.10s | Dec +52° 25' 42.30"
Observation Time 85 hours 22 min (3 days 13 hours 22 min). Actually, I thought of stellar black holes as larger in mass than intermediate black holes, but when we talk of smaller galaxy black holes merging onto big galaxy black holes how possible is it that stars cant be ripped apart due to strong gravitational and radiations emitted by the two galaxies, especially those within the black holes. I see this a bit contradicting as to a single black hole and its early stages. I was keen to know this black hole study. just wondering as black hole absorbs whatever it comes or falls in its way, so my question is after absorbing nearby star or planet does it totally doom it or that planet get merged inside another galaxy inside the black hole? as my understanding is that black hole is a shortcut made by merging end of the galaxies. A black hole found in the outer regions of a galaxy about 4.5 billion light years from Earth. X-rays from Chandra and optical data from Hubble. About 3.13 million light years across. X-rays are purple and optical red, green and blue.